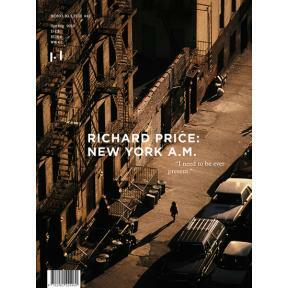 mono.konsum – mono.kultur #45 RICHARD PRICE: NEW YORK A.M.
mono.kultur #45 is our homage to the great mythical city that is New York. And who better to talk to about New York than Richard Price? The acclaimed writer gained international attention with novels such as Clockers and Lush Life, and his work for numerous films and television serials, including The Night Of and The Wire. But what he is really known for are his gritty observations of urban life and sharp ear for the rhythms of language. When it comes to research, Richard Price adopts a hands-on approach: hanging out in different neighbourhoods, talking to strangers and going for ride-alongs with cops to see a darker side of the city. In many ways, it is this wide-eyed curiosity that allows his books to be read as time capsules of a New York in constant flux, revealing an uncanny understanding for knowing exactly what people want, need, envy and resent about the cities they inhabit. In a conversation peppered with anecdotes and bebop, Richard Price talked to mono.kultur about the need to live in order to write, working for Hollywood, and why hanging out is a professional matter. Visually, the conversation with Richard Price found its perfect sparring partner in a selection of images by cab driver turned photographer Joseph Rodriguez. And, just between us, we are proud to feature our very first ever foil embossed cover, in the honourable tradition of pulp novels. "It is my honor to be published along side Richard Price, a storyteller mentor and hero for me. It was his early works that taught me so much how to listen and be patient for capturing detail and moments. Mr. Price, you truly inspired my Spanish Harlem book project."